19.06.2017 | Horbury, UK – Bathmate are set to add the Trim to the Bathmate essential range at ANME in July 2017. “The reason for bringing it to market is due to customer demand, always a good place to start”, says Tim Brown, Brand Manager at Bathmate. 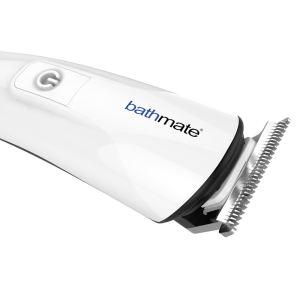 “To be able to use the Bathmate range of pumps effectively, the area where the pump seals to the body can’t be too hairy. If it is hairy then the pump simply will not make an effective seal. This me ans the customer will not be able to create a vacuum inside the vessel. So gents you must be manscaped. We are often asked how short the pubic hair needs to be to create a seal. The new Trim means you no longer have to guess. Included in the kit, as well as a full-size trimmer with four different guide combs, is a precision trimmer. The precision trimmer comes with an adjustable guide comb with four different lengths, and we recommend number three as the ideal cutting length to create a great seal. The reason why we chose the precision trimmer is to make manscaping easier, the smaller head is more manoeuvrable and gets into the tighter areas. We realised that having two heads with variable length attachments means the Trim can be used all over the body wherever hair growth needs to be kept under control. The Trim is USB rechargeable, has been extensively tested and comes with a 12 month peace of mind warranty.” More information at www.bathmatedirect.com.